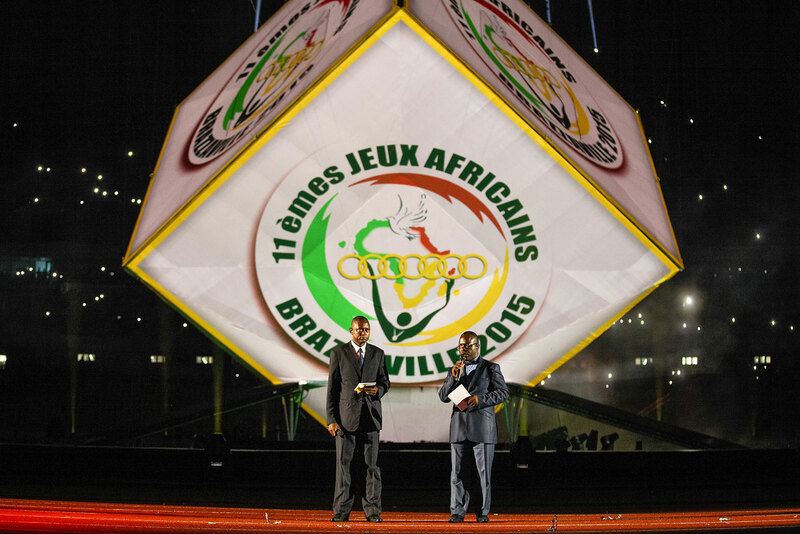 In the middle of a 50-metre pool (7 850m2), a hovering cube, which undergoes constant metamorphoses throughout the ceremony in order to dramatically present the strength and modernity of African youth and the balance between sport and local culture. On the heels of a gymnastic pre-show offered by the Chinese delegation, the ceremony, composed of 10 main scenes, represented a nation proud of its roots and confident in its future. Almost 1,000 local performers in communion with a highly ambitious technical set-up (rigging, machinery, video-mapping, special effects, pyrotechnics) made for a ceremony in which form and content converged perfectly. Offering a total immersion in local culture, the ceremony revisited traditions and honoured oral tradition, but was also anchored in modernity with a good dose of that particular brand of pride of Congolese young people. Due to the sporting competitions taking place on the site of the ceremony, we were only able to “take possession” of the venue two days before the show. We therefore had to put in place a complex logic of rehearsals, separating the live elements from the technical, in order to bring the two together once on site, at the last minute. 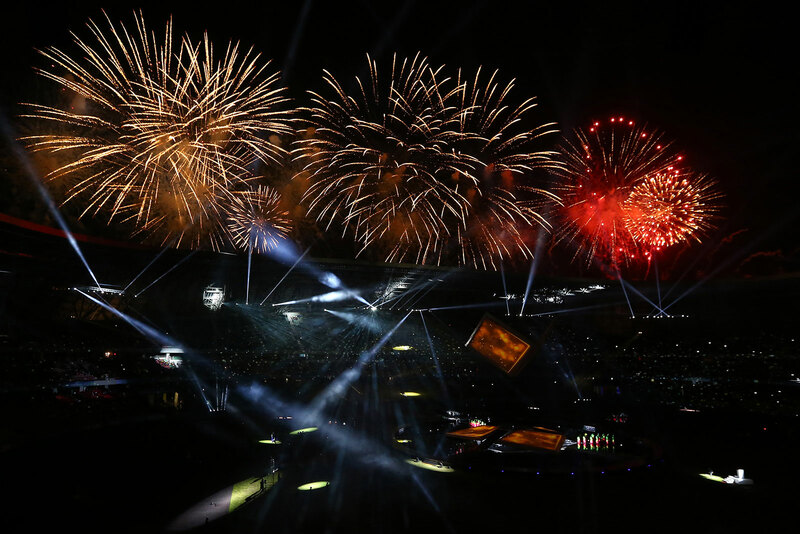 To add to the challenge, which was already complicated by the Games schedule, a sand storm blew up (something which the Congolese could not remember ever seeing happen there before) during our pre-show, two hours before the ceremony. 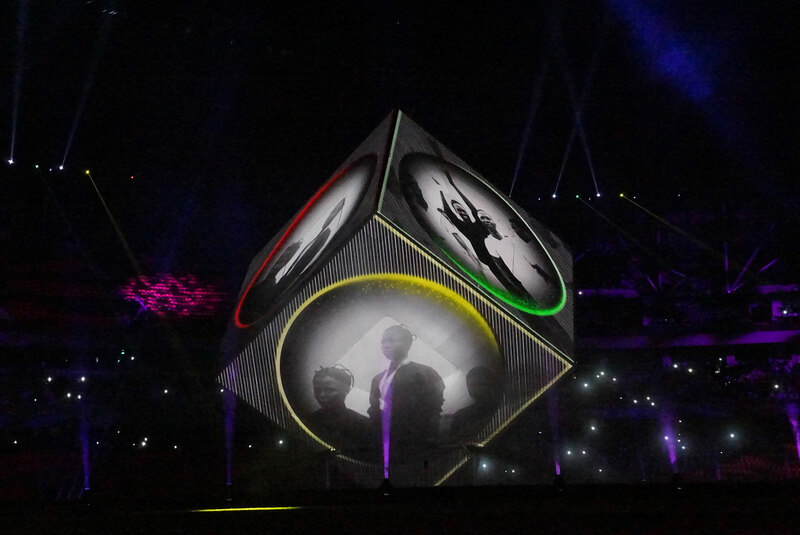 Thanks to the incredible technical team and the determination of all participants, the show took place in optimum conditions, much to the spectators’ surprise.